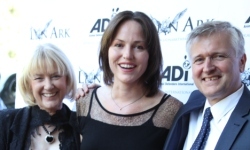 On October 5th, 2013 CSI star Jorja Fox gave a special introduction to the US Premiere of Lion Ark at the Mill Valley Film Festival. The premiere screening sold out the 300 seat CinéArts Sequoia Theatre, near San Francisco, after selling out at the world premiere at the Raindance Film Festival in London earlier in the week. Known to 73 million viewers worldwide for her role as Sara Sidle in TV’s CSI, Jorja Fox is an ADI Ambassador and as well as appearing in the film her company Seafox Productions is an Associate Producer of Lion Ark. Jorja witnessed the first steps of the lions on grass after their incredible 3,000 mile journey to safety during the film’s dramatic finale, “making her the perfect host for the US premiere” Director Tim Phillips said.